Christmas and New Year is over and the season doesn’t offer much else to brighten up the cold and dark days. MrGreen is no different and is therefore heading to beautiful and hot Mexico to tan away the winter blues. Being known for his generosity in addition to his dashing looks,he would like to give you the opportunity to do the same! He is also throwing in 5000 free spins each day for 50 lucky players! Travel in style to an exclusive 5 star resort in Mexico and spend a week relaxing on golden beaches,going for walks in the sunshine,eating spicy food and sipping on friuty cocktails. 5000 free spins are hidden in the Game of the Day each day as well ! Every day there is one raffle ticket to collect for the Dreaming of Summer prize draw. There are up to 15 tickets to collect in total. 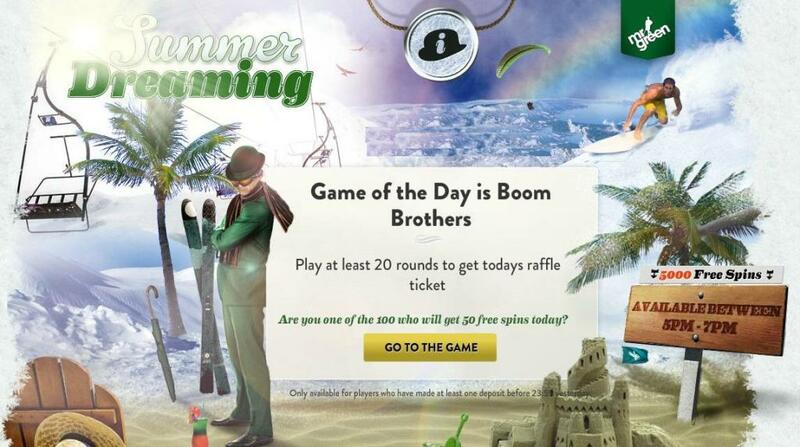 Play at least 20 rounds on the Game of the Day (visit mrgreen-campaign.com ) to collect your raffle ticket. 100 players get 50 free spins each, up to 75 000 free spins in total.